Moto G 3rd Gen is a rock solid phone at a very affordable price, if we look at the specs of the device and the IPX7 certification makes another good reason to grab the phone. Well, many people are already buying the Moto G 3rd Gen, but some of them want to get more from their phone and want to root it, but as you all know rooting a Motorola phone isn’t as easy as others, because you need to unlock bootloader before that. So, today I will provide a detailed guide on how to root Moto G 3rd Gen and before that, unlock the bootloader. The guide is a little long, just because of the bootloader, but don’t worry, follow the steps carefull and you can easily do it within half an hour. Unlocking the bootloader is the first job that we need to do before we root Moto G 3rd Gen, so let’s get started with that first. Step 2: Download and Install Latest Motorola Drivers from Motorola website. Step 3: Go to Moto G 3rd Gen Settings > Developer Settings and Select Allow OEM Unlock . Step 4: Switch off your Motorola Moto G 3rd Gen and Boot to Fastboot mode by pressing Power + Volume down button at the same time. Step 5: Now Open Minimal ADB and fastboot, which you downloaded onto your PC and open cmd from that file location, you can do it by pressing shift and click right at the same time. Step 6: Connect your Motorola Moto G 3rd Gen to PC via USB cable . Step 7: Type This on CMD fastboot oem get_unlock_data . Step 8: Go to Motorola’s website and Log in using your Google/ Motorola ID and paste the Copied String which you got in 7th Step. Step 9: Now complete all the Steps at Motorola’s Website and Request unlock key . Step 10: You will get an Unlock key sent to you via email, just copy it . That’s all, you have successfully unlocked the bootloader on your Moto G 3rd Gen. Okay, now bootloader is unlocked, but what about rooting? There is no use of unlocking the bootloader if you don’t root your phone, and also flashing ROMs get a lot easier with a custom recovery. I prefer TWRP, and on Moto G 3rd Gen I strongly recommend it as there are no physical buttons to perform any task on TWRP and you can easily use one screen buttons to flash new ROMs. 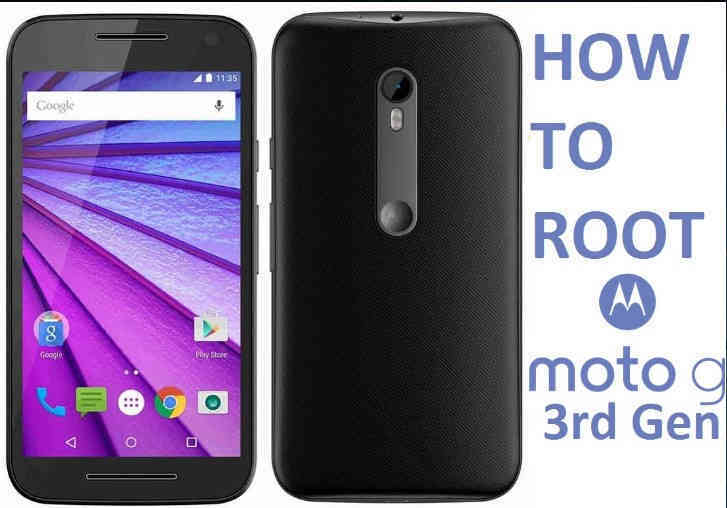 Below is the guide which you must follow to root Moto G 3rd Gen and install custom recovery. NOTE: Make sure you have unlocked the bootloader by following the steps above, and you have got at least 50% of power so that you don’t face any kind of problem. Step 1: Download the TWRP recovery for Moto G 3rd generation from here and place the file in your Fastboot folder and don’t forget to rename it to twrp.img. That is a part of process to root Moto G 3rd Gen. Step 2: Open CMD in that folder and execute the following command. Step 3: This will install TWRP in Moto G 3rd gen. Step 4: Now download SuperSU file from this link and place it in your phone. Step 5: Now boot to TWRP recovery mode and install the zip file downloaded above. Reboot your phone and holla, you have successfully rooted your Moto G 3rd generation phone. I hope you have enjoyed this combined guide on how to root Moto G 3rd Gen, unlock bootloader and install custom recovery. If you liked this guide, please share it with your friends who use the Moto G 3rd Gen and help them out. Apart from our guide on how to root Moto G 3rd Gen, install a custom recovery you can also check our other guides on rooting different phones here. Hope, you will enjoy and learn from them. Signing off! !